The two great turkey conundrums: 1) how to have juicy breast meat and tender dark meat and 2) how to serve it all hot to a lot of people. Last year, chatting with my neighbor, the excellent chef Doug Katz (Fire Food and Drink), described how he cooks the turkey in stock up to the drumstick so that the legs braise while the breast and skin cook in dry heat. Last year I tried it and it works brilliantly. Thank you, Doug. Doug posted his version on the restaurant’s blog. 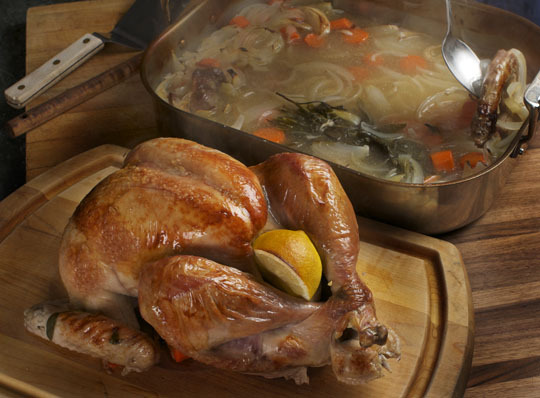 The basic idea is this: cook the turkey half submerged in flavorful liquid and lots of aromatic vegetables. When the breast is barely done, remove the turkey from the pan. Remove the legs (and wings if you wish). Return them to the braising liquid and finish them on the stovetop, while the breast rests. When the leg and thighs are done, remove the breast whole from the carcass, put them back into the pan skin side up and broil to crisp the skin and finish cooking the breast. Slice the breast and cut the dark meat off leg and thigh and wing. Put all the meat into a large service dish (or the roasting pan after you’ve strained the delicious cooking liquid into another pot). 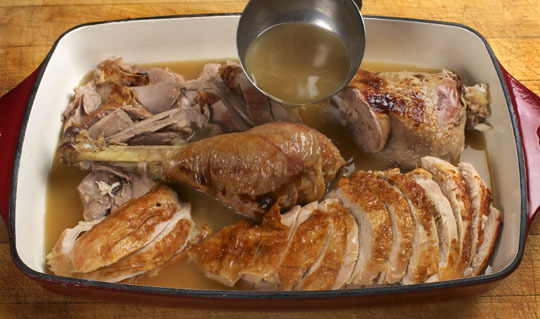 Ladel the hot braising broth over the carved turkey and keep it warm in oven or on stove top till you’re ready to serve. Use the broth to moisten and flavor a pan dressing (we don’t stuff our turkey anymore, nostalgic as I am for my Grandma Spamer’s stuffing). Roast/braise is the perfect technique, especially if you order from a local farmer (farm-raised birds can be tough in the leg—but not when you use this roast/braise technique). We bought the above from Aaron Miller who also raises great grass-fed beef, and will soon be offering lamb. Here’s my recipe and technique for perfect turkey served hot to all. Quantities will vary given the size of your bird and roasting pan, so I don’t always give amounts. You’ll have to use your most important cooking tool for this: your brain. We cook with our senses, one of which is common sense. Relax, don’t freak out, ask the right number of people to help in the kitchen, have fun and rejoice in this truly unique and wonderful holiday that celebrates the cooking and eating and sharing of food with the people we love. Preheat your oven to 425 to 450 degrees F/218 to 232 degrees C.
Combine all the vegetables, garlic, bay leaves, most of the herbs, pepper and tomato paste in a roasting pan just big enough to hold turkey and vegetables. Stuff a quartered onion, remaining herbs and the lemon into the cavity of the turkey. 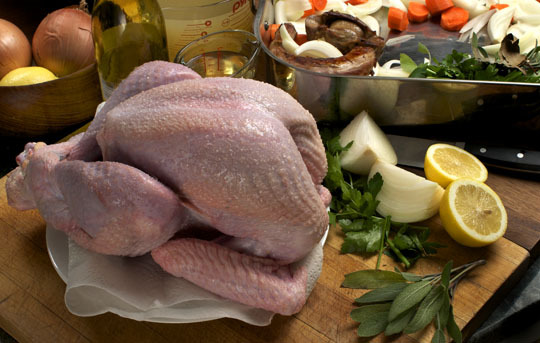 Nestle the turkey in amongst the aromatics (notice how all these ingredients are what we use to make stock?). Pour in the wine and enough stock and/or water to come up above wing and thigh. Add an aggressive 4-finger pinch of salt. Put the roasting pan over high heat on your stove top and until the liquid comes to a full simmer. Put turkey in the oven, reduce heat to 350 degrees F/177 degrees C. Roast until a thermometer in the fattest part of the breast, just above the wing joint, reads 155 to 160 degrees F./68 to 71 degrees C. I use this cable thermometer which sounds an alarm when I hit the right temperature and I don’t have to keep opening the oven and jabbing at the breast. Baste with butter or fat every 20 to 30 minutes. This bird took 80 minutes. A bird twice or more its size will take around 2.5 to 3 hours. Give yourself ample time (it all keeps warm so better that it’s done early rather than late). Remove the turkey to a platter. Now this is important: Present the turkey to everyone. Parade it, admire it. Remove the legs at the thigh joint. Return the legs to the braising pan. If you wish, remove the wings as well and add them to the pan. Continue simmering on the stove top, another half hour or so, until the thighs and drumsticks are tender. The breast should rest like this for at least a half hour or for up to an hour if you need that long to finish the dark meat. When the dark meat is done, preheat your broiler and arrange an oven rack so that you can put your roasting pan close to the broiler element. Remove each side of the breast. Add the whole breasts to the roasting pan skin side up. With all pieces skin side up, finish the turkey under the broiler until the skin is crisp and the breast has been rewarmed and cooked. Slice the breast cross-wise so that every piece has some skin. Separate the leg and thigh and carve the dark meat off the bone. 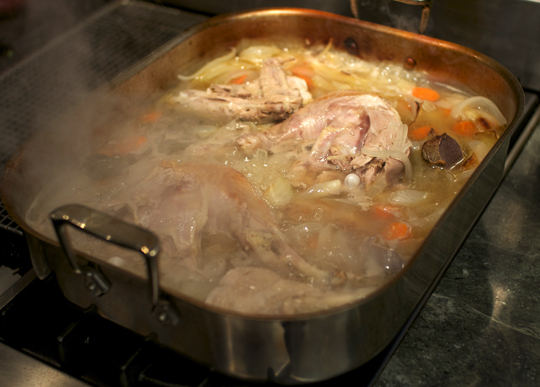 Strain the braising liquid into a pot, discarding the vegetables, and bring it to a simmer (it helps to have someone else do this for you while you’re cutting turkey!). 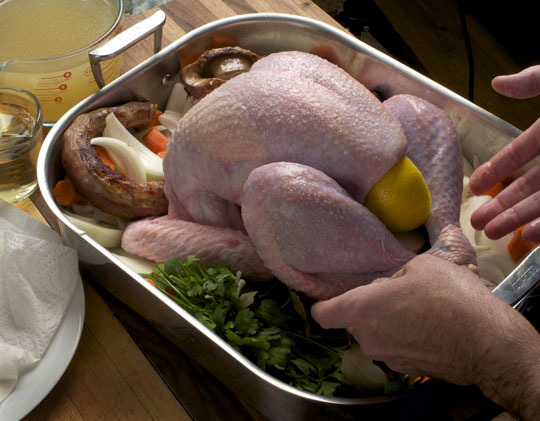 If you’ll be serving the turkey from the roasting pan, rinse it out and rewarm it. If you’re using another service dish, warm that. 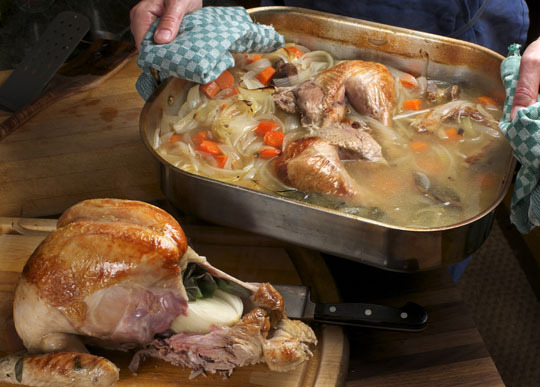 Arrange the turkey in the serving vessel and ladle the hot broth over the turkey. You can cover this with foil and keep it warm in the turned off oven, or on the stove top, while you ready the rest of the meal. Be careful not to overcook the breast, though the broth will always keep it moist. Notes: If you want to add even more flavor to this, saute the vegetables in the roasting pan first. Have a look at Doug’s recipe, linked above; he puts things like apple and parsnips in his. I roasted the neck and gizzard and added it to the braising liquid. If you want, finely chop the gizzard and add it to your gravy. When you’re done, you should have plenty of braising liquid. Add this to your stock pot when making stock from the leftover carcass and bones. Roasted cauliflower from Twenty is a great addition to Thanksgiving dinner. Looking to grill your turkey try my Spatchcocked Grilled Turkey recipe. The Sassy Radish shares a recipe for butternut squash and pear soup with garam masala. We’ve always prepared wild turkey, which has a tendency to be tough and dry, with a similar method. I suspect we are already wired into how we are doing the turkeys this year, but I will point this out to my wife for future use. They’re not quite done there. They go back into the hot liquid where they finish cooking when legs and thighs are done. Thanks for the great post(s) Michael. I actually used a variant of this method last night to prep my wings and drums for making stock. I don’t want to take anything away form this particular discussion but I’m curious about what vessels you find best for making large roasts in. I’ve got a glass baking dish and sometimes use those disposable aluminum pans but I really think it time to upgrade. I see you’ve got what appears to be a steel roaster in one shot and possibly an enamel covered cast iron in other. Any quick thoughts or link on the topic you care to share? I love steel. Cast iron enamel also great, as is cast iron. But anything works for roasting as long as the sides aren’t too high. To Ryan: Be careful with the glass baking dishes and broilers. Could have explosive results. I’m a briner Michael. The bird comes out very juicy. Don’t use wild turkeys, but Willie Birds from Petaluma. Good bird. BTW, stock is done and ready to be gravy. We got our bird from a farmer this year also. 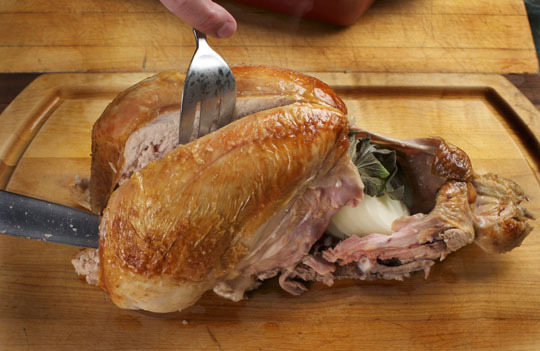 Did you brine your turkey before roasting? We have an organic farmed bird this year and this method is very interesting. 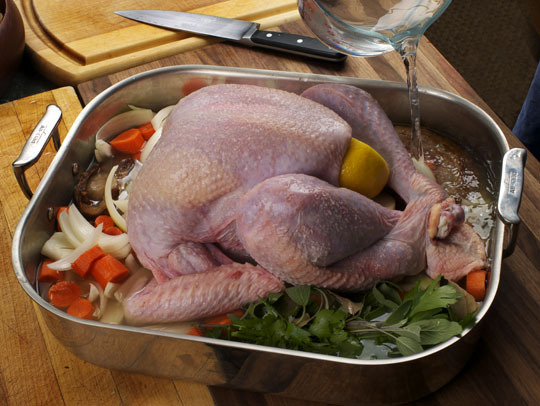 While cooking in all that liquid, would you say that I should still brine the bird? Why did you preheat to 425 degrees with nothing in the oven, then when you put the turkey in you took it down to 350? is it to take advantage of some early high-heat? Can you elaborate more on the texture and flavor? My main gripe with wet brining is the meat becomes too “spongy” and my first reservation here is that braising would yield similar results. I prefer meatier, roasted turkey (not mistaken for dry), and I “dry cure” mine by salting the entire bird a day or two in advance. The other downside to this is you lose the drippings and fat that you can immediately use to make a pan gravy on the spot. i like the dry cure method too. wet cure allows you to flavor and season the meat throughout. agreed on the drippings but i find not a big impact on flavor of gravy. In other stock applications, I’ve noticed you eschew celery because of its bitterness. So why include it here? I’m not trying to be snarky here; I’m genuinely curious. Also, Donna’s photography is not only gorgeous, but aromatic as well. I can smell that turkey with my eyes! i just like it for thanksgiving. i also like it in the dressing. celery. You and Donna outdid yourselves on this one – I’m the scrooge of Thanksgiving because I’m such an excited overgrown kid about Christmas and normally just want Thanksgiving out of the way so I don’t have to hide my anticipation any longer – now you two have made me want to savor my turkey dinner. Thanks! 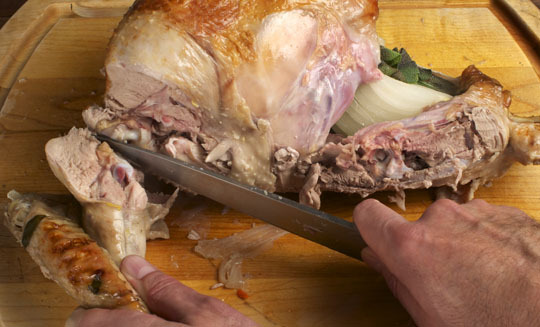 I also like dry brining but what I don’t understand is: 1) why stick the legs in through the skin pocket over the pope’s nose to simulate trussing and 2) why not pull or cut the leg tendons so that they shorten on cooking and thereby make sure the very end meat of the leg does not over cook. I never truss any poultry any more and prefer to leave the legs akimbo in order to facilitate the inner meat of the thigh cooking so that the thigh meat and the breast meat are “done” at the same time. I also prefer to never stuff birds but like to cook stuffing outside of the bird. I will however stuff birds (with a bread stuffing that really only needs warming up) if requested. I now rarely have problems with overdone breast meat and/or underdone thigh meat and cook with a temperature probe inserted between the thigh and the breast to 155* – 160* F.
You have inspired a 30 year pescatarian(me) to make turkey stock for our thanksgiving dinner! I had to use an independent taster, but it was deemed very tasty. The photos are always beautiful and even when you just talk meats, I find interesting comments, techniques, tools. Great site, thanks. That is waaaaay too much canoodling around on a day when I’m already busy making half a dozen side dishes to cater to the varying tastes of the family. If I’m going to cook a dismembered turkey, I’m going to start with a dismembered turkey, not start messing around with a hot, dripping wet, half-cooked bird. Anyway, gravy cures a multitude of sins. I also wonder why the heck anyone would truss the legs when the problem is that that part of the bird cooks slower. I’m going for the dry-brining method I saw on food52, which also involves cooking the turkey breast side down for the initial cooking. Why this isn’t done more I don’t understand. If I made turkey more than once a year I’d certainly experiment as there must be a better way. As with most recipes, they seem much more complicated when all the steps are in writing. Learn the recipe, and it will seem easy. I just don’t understand this mindset; Thanksgiving is THE cooking holiday, and if you’re a cook (you’re reading this blog aren’t you?) I’d think you wouldn’t be afraid of a particular technique being too complicated. I’m with ya, Elisabeth. 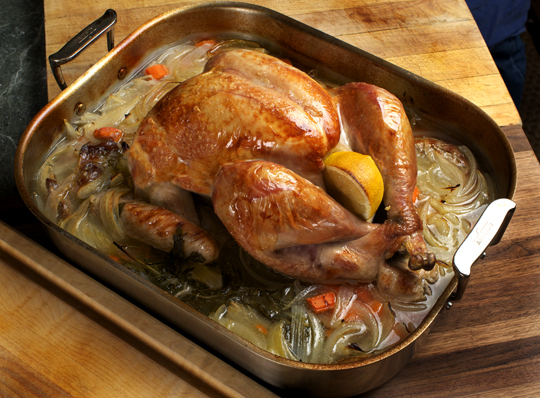 All that liquid in the oven will inhibit browning — see Keller’s instructions for roast chicken. You can try to compensate at the end, but you risk drying it out. Also, you loose the fond for the gravy. Breast side down for the first 1/3 to 1/2 cooking time helps to even out the cooking of the white and dark. Add a cup or so of wine after flipping if you suspect leg toughness. Cook until the breast is done, remove the fat and drippings, deglaze the pan for the gravy, then put the leg/thigh back in with stock and wine until it’s done, if it even needs it after cooking “upside down”. 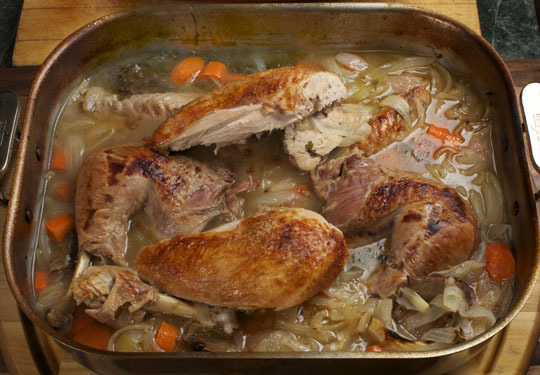 If you really suspect your bird is tough, then the braise method makes some sense. as you can see, the breast is nicely browned, and it all gets further browned beneath the broiler. agree about the fond issue, but you could sear the bird first. In addition to searing (which Ruhlman mentioned below), if you use roast turkey stock as your braising liquid then there’s already plenty of fond in that. As Animal once said, “More fond! More fond!” One fond is not enough. Here is a two fond turkey stock, one more to go, with the real turkey this time. Totally agree. One year we tried a deep fried turkey and have never gone back. I brine the bird overnight, and set it out to dry for an hour or so before frying. Spouse has an Alton Brown-like set-up involving a large ladder, pulley system and turkey deep fryer apparatus, set well away from the house . A 20ish pound turkey is done in about an hour. Advantage of this system? Gets the turkey out of the house. Men too. The kitchen is a much calmer place for those last minute fire drills. We have fed probably a dozen different people over the years and get nothing but raves. 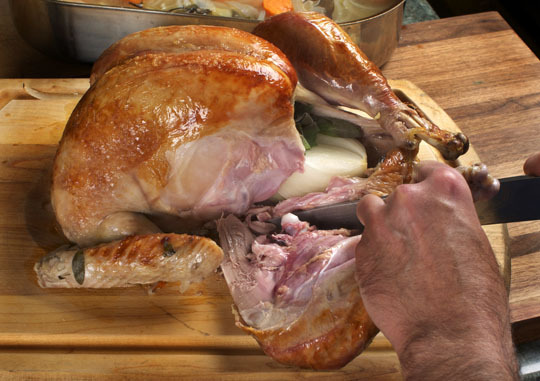 Any reason you couldn’t just dismember the turkey from the get go and avoid carving a hot, wet, slippery bird? Then you could just remove items (breast, legs, wings) as they near doneness, then slip them all back in for a quick crisping at the end. I’d even go further and say broil the turkey separately while you strain the liquid and make gravy with it. Sure, there is no oohing and aaahing over a pretty bird, but that’s not an issue with my family. I’m either going to do that or else spatchcock the turkey and roast it on a rack over the stuffing. I really like presenting the bird. but no, there’s no reason you can’t do it. it’s the way most chefs like to do it. Something I tried recently (and that I think would work well with this) is to reserve some of the cooked carrot/celery/onion, add to a blender along with the stock, then puree. You end up gravy that’s been thickened with veggies. Delicious. I do the same thing with chuck roast – sear roast, saute carrots & onions (sometimes celery), deglaze with stock and add herbs (usually thyme/parsley), then use an immersion blender to blend it into a thick gravy at the end of the braise. I really hope these questions can get answered….I’ve been searching for 3 days and can’t find an answer and I’m freaking out a little bit because this is my first turkey and I’m hosting Thanksgiving this year! 2. High heat to “seal in the juices” for the first 40 mins? 3. What temps should I cook if using Convection? 4. How long will it take to cook a 16lb. turkey with a convection oven using this recipe (how long till it comes out before the legs go back in)? 5. What temp. should the breast meat be when I take the turkey out to cut and braise the legs? 6. 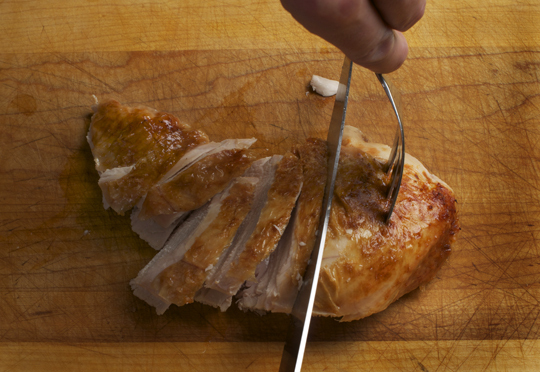 Should I use an electric thermometer that stays in the turkey breast? 2) High heat browns meats so they become tasty and make delicious drippings, but it doesn’t seal anything. 3) If using convection lower the temp by about 25 degrees, but this is not an exact science. The only exact science is your thermometer. Take the turkey out when it’s up to temp and you’ll be fine. There’s nowhere written in stone you have to roast at any precise temperature–it’s all relative. Higher heat for more browning, lower heat for longer roasting. 4) As written in the blog it will probably be somewhere greater than 80 minutes and less than 2.5-3 hours. Perhaps 2 to 2.5 hours? That should be close enough of an estimate so you can plan your other dishes. should have read this first and said ditto! good luck and use your common sense! Not to be flippant, and I’m sure this method produces a mighty tasty bird, but the entire “turkey conundrum” was not an issue until recent years. By what complicated alchemy did our grandmothers solve this vexing problem? By adding mass and moisture to that part of the turkey (the breast) that would otherwise dry out by the time the dark meat was done cooking. You might know it as stuffing. And our crazy forbearers used to actually “stuff” their birds with it. Amazing. 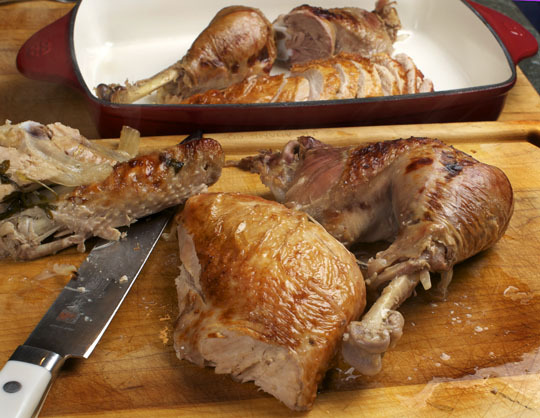 So you can braise or foil, and cut up your turkey before roasting. Or you can simply put the “stuff” back in your stuffing. And yes you can still fill that giant casserole with back up stuffing. It crisp up nice but it won’t taste quite as good. Unfortunately, a turkey can never seem to hold enough stuffing to go around. Now THAT is a conundrum that i’d like to see solved. The above method that involves wrestling a heavy turkey that’s partially submerged in boiling liquid into the oven is not likely a method that will be used by most home cooks, (it looks dangerous, frankly) particularly by those cooks who have only one oven for the final broiling requirement, and are busy cooking the numerous other components to this meal. I’m with Scott on this one. My mom and grandma cooked fabulous turkey dinners with stuffing in the turkey…and so do I. If you put stuffing inside the cavity, then you certainly add mass, which increases the cooking time because you need to get the center of the stuffing up to temp. By then, the breast is dry. 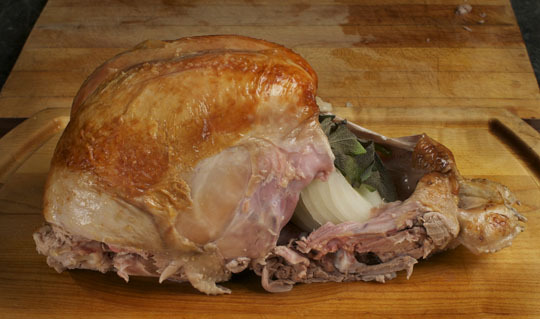 Putting stuffing inside the cavity does not prevent the breast from drying out. I don’t care how much moisture you try to add to white meat, if you cook it well beyond 165-170 degrees, it’s going to be dry. I cook the turkey covered, so that it actually steams. As I stated above, I put dressing between the skin and the breast, thus insulating it somewhat. I finish my turkey uncovered, thus browning it. I will add that I cook only small turkeys, 10-12 pounds or less. If I need more turkey I’ll cook two small turkeys…never one monster bird. My turkeys are very, very well cooked, legs almost falling off, etc. Yet I can gently push the sliced breast meat and see juice running, and each slice of white meat has a lovely border of sliced dressing under the crisp skin. I don’t mean to dis Michael, but I’d like to see this turkey cooking technique accomplished in a typical kitchen with one oven, while making all of the side dishes, while entertaining a houseful of people (many of whom will be watching football/drinking) with assorted toddlers and small children wandering about….yep, I’d like to see that. This is likely a good technique, I get that. But it has a slight whiff of testosterone….of being driven by the perceived problem/scientific solution as opposed to the practical reality of the vast majority of North American kitchens on Thanksgiving day. Amazing! Beyond a doubt, the best turkey I’ve ever made. The family thought it was outstanding, and agreed this is the only way to cook our turkey from now on. Followed the basic technique as you described. 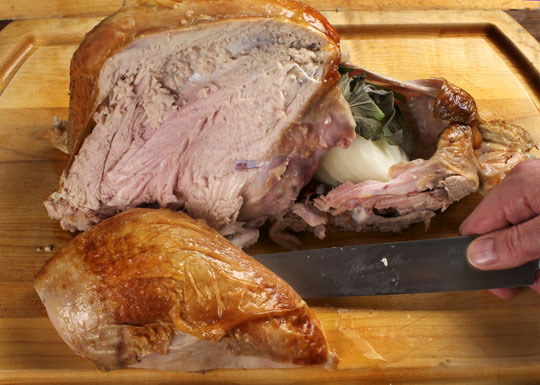 Turkey came from Brunty Farms in the Cuyahoga Valley (you ought to look them up. All natural, local. A nice young couple who raise and sell outstanding poultry). Dry brined it Tuesday evening. This morning I separated the legs and wings and roast-braised using my own canned turkey stock. BTW — hats off to you for being able to remove the legs and wings while nearly fully cooked. I don’t yet have that skill set. It was wonderful having the turkey carved and ready when company arrived. The fact that it was moist and incredibly flavorful made it a hit. Served with lots of warm gravy made from the braising liquid, it was a hit. And now a new tradition for us. Thanks again Michael. Happy Thanksgiving to you and yours. thanks for the comments john! Wow. I’m going to try this out just by peeking at the photos. It sure look very tasty! It is going to take a ton of effort to handle that menace giant turket! Love those photos-thanks for mentioning our blog! This is brilliant. I will be preparing my next turkey this way. Am also sending it to my daughter who had a farm-raised turkey and did say it was a bit “stringy”. In recent years, I`ve made a discovery that may seem like sacrilege to some…oven bags work really, really well. I`m the type of home cook abhors cutting corners, but I think that this method deserves some consideration because the results are just objectively good. My family`s 15-20lbers (brined) are so well-cooked that the breast is just faintly light pink yet can be removed from the carcass in one perfect piece, clean away from the ribcage and sternum, without using a knife. Ditto the legs, i can remove each leg at the hip by simply sticking the tip of my knife in the hip joint and slightly twisting. All the little flat bones (what are those?) 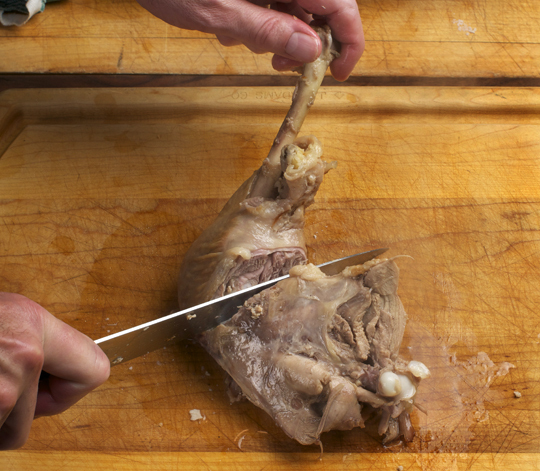 in the drumstick are removed in one fell swoop by grabbing the cartilage of the knuckle and removing it all at once. Best of all, the skin browns excellently, particularly if you have a proper raised roasting pan with a rack, open the bag (which must be vented and coated in flour before you start) drain the juices (all perfectly reserved in the bottom of the bag), dispose the bag and put the bird back in the hot oven for perhaps 15 minutes max. This step is unneccessary, but results in a bigger proportion of perfect skin. The underside of the bird is never perfectly crisp, but barring a rotisserie I am not sure I have ever seen a technique where the bird is perfectly crisp on the bottom – it has to rest on some moist surface. 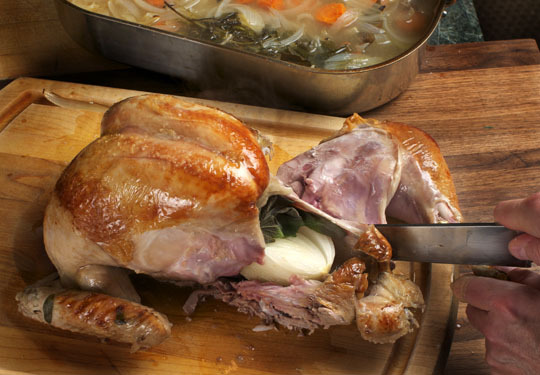 Anyway, this technique is incredibly easy and eliminates bad, dried out white meat and purple-pink dark meat at the thigh bone/hip joint – without any fussing save an occasional thermometer check. Cooks faster as well. I never thought I would support a short cut or `gimmick`like an oven bag but I have to say I am converted. I used this for my turkey this year, and it came out PERFECT. I am thrilled, thank you so much for the easy, different, and fun recipe. This is now my standard method for doing big, difficult birds. we’re hooked on Alton Brown’s brining technique. since we started using it, we’ve never had a single piece of dry turkey, and the extra little salt boost is very nice. the only thing it doesn’t provide is good drippings for gravy (the result is far too salty), but your pre-make-your-stock tip last week solved that problem nicely (wonderfully, in fact). want crispy skin? just before serving, strip the skin off and throw it in the toaster oven for three minutes! Finally got back to your site and wanted to report that I made the turkey pretty much following your technique (though I did break it down first). Used fresh thyme & parsley from my garden, onions grown by my mom, local free-range turkey (only $2.29/lb!). It was amazing – best turkey I ever made, and I’ve made some pretty good ones. While the turkey rested I strained the “stock” and made gravy with it. My father, who in 30+ years has given me about two compliments, said it was really good gravy. Thanks for the inspiration. Thanks for posting this!! This year was my very first roasting a turkey and it was absolutely amazing. The meat was juicy and tender the day we served, and stayed that way all the way through Leftovers Week. I may have used a bit more tomato sauce than yours calls for, but it was still delicious. Put Thanksgiving In My Face & Then Leave Me Alone.